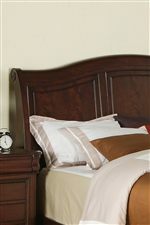 Create a relaxing bedroom environment you will truly enjoy with this beautiful sleigh bed. The large arched headboard and gently sloped footboard feature detailed case paneling and smooth edge moulding for a transitional style. Finished in a rich dark brown hue to easily matching with your room decor. This bed is available in Queen and King sizes. 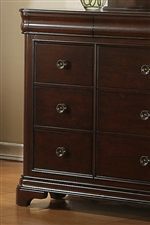 The Cameron Queen Transitional Arched Sleigh Bed by Elements International at Miskelly Furniture in the Jackson, Pearl, Madison, Ridgeland, Flowood Mississippi area. Product availability may vary. Contact us for the most current availability on this product. Drawer / Shelf Construction French and English Dovetail connections. Felt-lined top drawers.